Posted on Wed, Feb 8, 2012 : 10:31 a.m.
Say 'I love you" on Valentine's Day with this easy and quick recipe for Strawberry Mousse. My parents have been married for 41 years, and are possibly the most compatible couple I have ever known. If you ask me, they are what Valentine’s Day is all about. It’s not about jewelry or romantic vacations or dozens of roses, but rather a deep, comfortable and abiding love. I've always looked at their relationship as a guide for how to do it right. They don't wait for special occasions to show their affection. (In fact, my dad still hasn't lived down the time he looked at Mom blankly on their anniversary and asked: "Is this a card-giving occasion?") Instead, they've always gone out of their way to take care of each other in big and little ways every moment they are together. It's a beautiful thing. This recipe is one that my mom used to make for the whole family on Valentine's Day. It comes via the iconic I Hate To Cook cookbooks from Peg Bracken, a staple of many 1970s American households. Bracken was an early precursor to the Sandra Lee "semi-homemade" style of cooking, but delivered it all with a hefty dose of wit and humor. The title Peg Bracken gave this dessert is "pots-de-strawberry," which seems to be a take on pot-de-creme, a French custard-based dessert. It's lighter than that, though. More like a tangy strawberry mousse. As long as you have a blender, you can whip this up in just a few minutes. It's incredibly simple, and there are myriad ways you can choose to present the mousse. My mom notes that she often serves it in demitasse cups with a long wafer or cookie on the saucer, or in a stemmed glass with fresh strawberries. I've been playing around with serving ideas, myself. I love chocolate and strawberries combined, so I sought out some chocolate cups — you can even find heart-shaped chocolate cups this time of year. 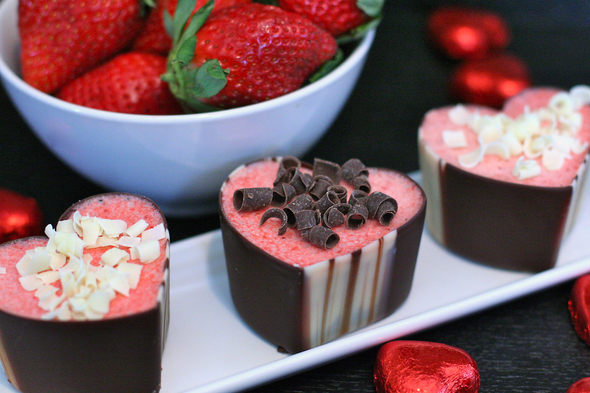 Top the mousse with some shaved chocolate and you've got a perfect, easy Valentine's dessert. Or be like my parents, and don't limit yourself to romantic holidays. Use this incredibly simple dessert to say "I love you" any day of the year. Put the gelatin in blender and add the hot water. Cover and blend for 15 seconds. Add the strawberries and blend another 5 seconds or so. Set the bowl in the refrigerator for 10 minutes. It should start to thicken. Add the heavy cream and blend for just a few seconds to mix it. Pour into small bowls or cups and chill for several hours. Garnish with whipped cream, shaved chocolate or strawberry halves. Jessica Webster leads the Food & Grocery section for AnnArbor.com. You can reach her at JessicaWebster@AnnArbor.com. Wed, Feb 8, 2012 : 8:06 p.m. I found the heart-shaped chocolate cups at Cost Plus World Market. They still had quite a stash of them in a Valentine's Day display over the weekend. You could also make your own, if you're the crafty type. Wed, Feb 8, 2012 : 5:30 p.m.
Where can you find heart-shaped chocolate cups? Wed, Feb 8, 2012 : 7:06 p.m. I believe I've seen this done. You melt chocolate per usual and coat ramekins, then chill. Wed, Feb 8, 2012 : 6:58 p.m. Yes, can we make those as well?